I suggest giving your kitty or dog one tablet a day of Standard Process’s Feline Renal Support tablets. 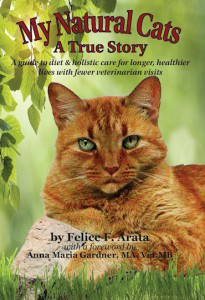 I have given this supplement tablets to all our cats starting from 7 years of age just for additional support from the aging process in addition to feeding them our raw recipe. Dr Anna Wolf started out Lady Natascha on them at age 16 when she her kidney levels started showing higher than normal in her blood work. After she was on the SP Feline Renal Support tablets for 30 days, I rechecked her blood work and the levels went back into the normal range. I was very impressed with this additional supplement to support the kidneys. None of our cats have passed away by kidney or thyroid failure, and they lived to 19 and 20 without those health issues.